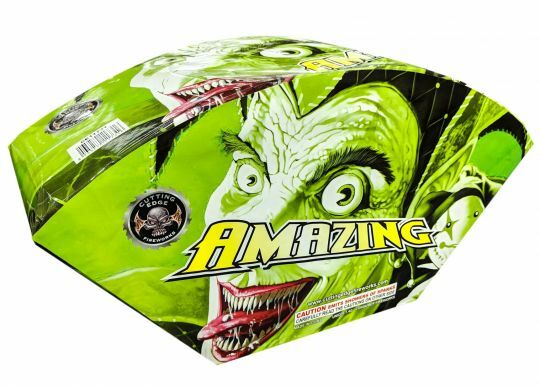 Amazing gives a shower of sparks for more than two minutes. It features lots of white crackle with alternating red, green, and blue pearls. It ends with a huge barrage of sparks and color! Talisman is a large fountain, featuring a 2-minute burn time and loaded with colors and effects! It starts with red, green, and blue flame-drops, and transitions into rounds of assorted color stars and crackling. Party Pyrometer is a big, fan-shaped 500 gram fountain with tons of show. Effects include, red and green stars with shimmering gold sparks; red torches with white fountains; gold shimmering; crackling - and more! Forget Me Not sprays a shower of red sparklers and pine needle, then red and green sparks with crackle, peach glitter, finishing with silver crackle. This piece lives up to it's name! I used this piece as my finale in my 4th of July show and got more whoops and cheers that larger sky burst pieces- definitely not " just a fountain! Best Fountain I have seen in a long time.